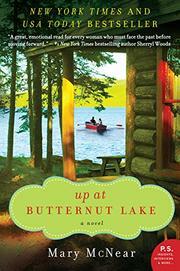 The first in a homey, feel-good series, McNear’s small-town tale offers lakeside views and likable characters. Since her husband’s death in Afghanistan, Allie can no longer bear the intrusiveness of suburbia: the pitiful stares at the grocery, the useless advice, the weight of all those happy memories. So she sells the house, puts her furniture in storage, and moves herself and 5-year-old Wyatt to her family’s cabin on Minnesota’s Butternut Lake. Though slightly derelict, the cabin will be their new home, a new start. There, she reconnects with childhood friend Jax (pregnant with girl No. 4) and Caroline, owner of the local diner. Things seem pleasingly unchanged in Butternut, except for the large lake house that has recently appeared across from Allie’s more modest cabin. The modernist affair belongs to the town’s most eligible bachelor, Walker Ford, owner of a string of successful boatyards. It seems inevitable that Allie and Walker will make their ways to each other, but there is a novel’s worth of obstacles in their path: Allie’s fear of betraying the memory of her husband, Walker’s fear of commitment, and their mutual, initial dislike for each other. While their romance works itself out, there is other trouble in Butternut: Jax’s old boyfriend (and secretly the father of her first child) is out of prison and is blackmailing her to keep quiet. Caroline, bereft that her only child has just moved away to college, brushes off the advances of a friendly retired pilot. And then, despite a passionate weekend together, Allie misinterprets a visit from Walker’s ex-wife and calls off the blossoming romance. Jax’s husband finds out about the blackmail, and the two separate. Caroline eases her loneliness by babysitting Wyatt. Will the three women remain alone by novel’s end? Unlikely. Plot really isn’t the point of books like these; it’s about the characters, and McNear has admirably crafted people worth following.